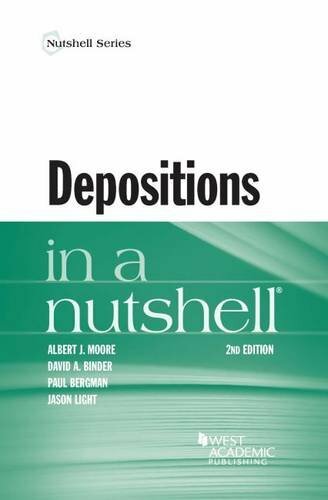 9781634598958 | 2 new edition (West Academic, March 1, 2016), cover price $43.00 | also contains Depositions in a Nutshell | About this edition: This Nutshell, which replaces Binder, Moore and Bergman's Deposition Questioning Strategies and Techniques (2001), provides comprehensive descriptions and concrete illustrations of effective strategies and techniques for taking and defending depositions. 9780314194893 | West Academic, November 29, 2010, cover price $43.00 | About this edition: This book provides comprehensive descriptions and concrete illustrations of effective strategies and techniques for taking and defending depositions. 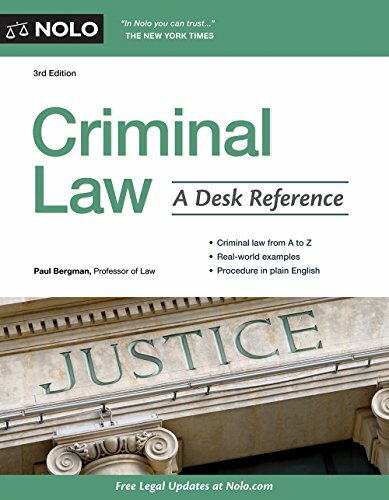 9781413322439 | 3 edition (Nolo, December 31, 2015), cover price $44.99 | About this edition: Understand criminal Law! 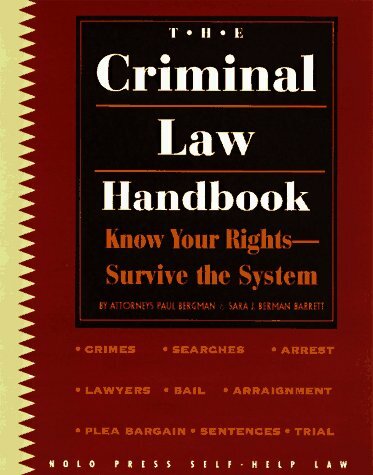 9781413319934 | 2 edition (Nolo, December 30, 2013), cover price $44.99 | About this edition: Demystify criminal law. 9781413313673 | Nolo, December 23, 2011, cover price $44.99 | About this edition: Take the mystery out of criminal law Criminal law can be a maze of conflicting principles, strange jargon, and confusing procedures. 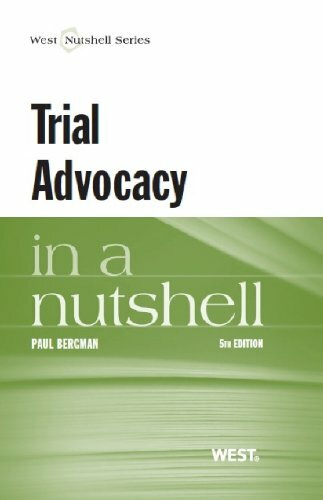 9780314284396 | 5th edition (West Academic, January 16, 2013), cover price $43.00 | About this edition: Trial Advocacy in a Nutshell was one of the first works to analyze and illustrate discrete courtroom skills and techniques in the context of principles of persuasion. 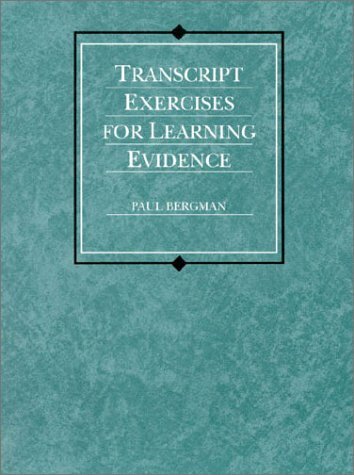 9780314169297 | 4th edition (West Academic, October 31, 2006), cover price $39.00 | About this edition: Paul Bergman is a Professor of Law at the UCLA School of Law and a recipient of a University Distinguished Teaching Award. 9780314212009 | 3rd edition (West Group, August 1, 1997), cover price $27.00 | About this edition: Constructing Arguments for Trial-Credibility Arguments, Inferential Arguments, Normative Arguments, Silent Arguments; Trial Techniques, with an Emphasis of How to Advance Arguments Throughout the Trial -- Opening Statement, Direct and Cross Examination, Closing Argument, Exhibits, Objections, Jury Voir Dire, Experts; Illustrations from O. 9780314664938 | 2 reprint edition (West Group, October 1, 1989), cover price $16.90 | also contains The Great Barrier Reef: An Environmental History | About this edition: Constructing Arguments for Trial-Credibility Arguments, Inferential Arguments, Normative Arguments, Silent Arguments; Trial Techniques, with an Emphasis of How to Advance Arguments Throughout the Trial -- Opening Statement, Direct and Cross Examination, Closing Argument, Exhibits, Objections, Jury Voir Dire, Experts; Illustrations from O. 9781413311990, titled "Nolo's Deposition Handbook" | 5th edition (Nolo, June 3, 2010), cover price $34.99 | About this edition: Take the mystery out of your deposition with this comprehensive guide. 9781413301786, titled "Nolo's Deposition Handbook" | 3 edition (Nolo, May 31, 2005), cover price $29.99 | About this edition: Take the mystery out of your deposition with this comprehensive guide. 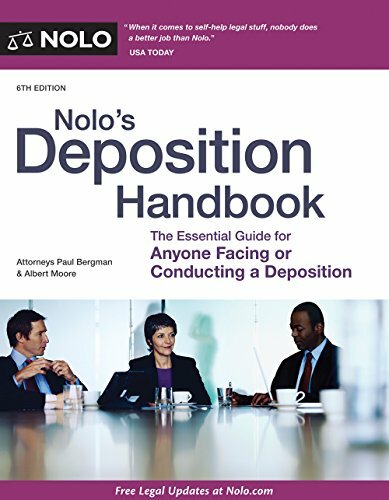 9780873377669, titled "Nolo's Deposition Handbook" | 2nd edition (Nolo, September 1, 2001), cover price $29.99 | About this edition: Take the mystery out of your deposition with this comprehensive guide. 9780873375382 | Nolo, October 1, 1999, cover price $29.95 | About this edition: Getting deposed can seem as mysterious and complicated as the tango. 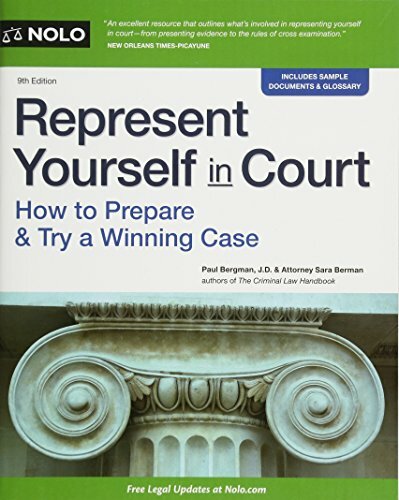 9781413303698, titled "Represent Yourself In Court: How to Prepare & Try a Winning Case" | 5th edition (Nolo, January 31, 2006), cover price $39.99 | About this edition: For people dealing with a personal injury claim, a landlord-tenant dispute, a small business scrape or any of the dozens of other possible legal muddles, this book points the way through the complex court system. 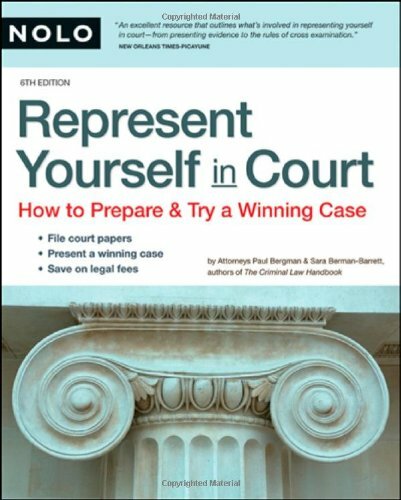 9780873379083 | 4th edition (Nolo, January 1, 2003), cover price $34.99 | About this edition: Describes courtroom layouts, rules and customs, and looks at legal procedures, evidence, and goals. 9780873376112 | 3rd edition (Nolo, February 1, 2001), cover price $34.99 | About this edition: You probably can’t afford to pay a lawyer upwards of $200 an hour to represent you in a civil lawsuit. 9781413305142 | 8 edition (Nolo, August 30, 2006), cover price $39.99 | About this edition: Do you know what happens when you are accused of a crime? 9781413303568 | 7 edition (Nolo, September 30, 2005), cover price $34.99 | About this edition: Do you know what happens when you are accused of a crime? 9781413300574 | 6th edition (Nolo, July 31, 2004), cover price $34.99 | About this edition: Do you know what happens when you are accused of a crime? 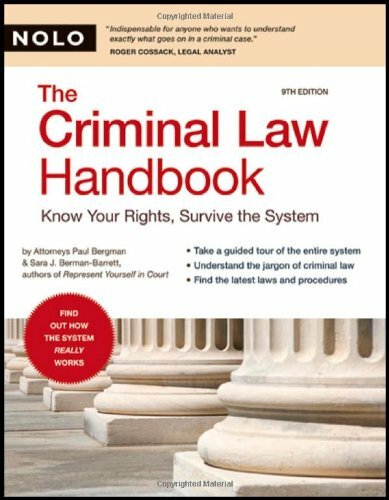 9780873379281 | 5th edition (Nolo, March 1, 2003), cover price $34.99 | About this edition: Answers questions about the criminal court system, discussing the roles of lawyers, police, and judges, and covering such topics as bail, preliminary hearings, evidence, lineups, and sentencing. 9780873378048 | 4th edition (Nolo, February 1, 2002), cover price $34.99 | About this edition: Do you know: *what happens when you are accused of a crime? 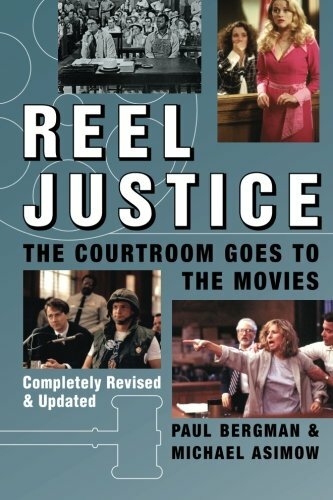 9780740754609 | Andrews McMeel Pub, April 1, 2006, cover price $16.95 | About this edition: From the earliest days of the movies, filmmakers have turned to the courtroom for stories because it is an ideal setting for both drama and comedy. 9780836210354 | Andrews McMeel Pub, May 1, 1996, cover price $16.95 | About this edition: From the infamous Scopes Monkey Trial, portrayed in Inherit the Wind, to the sensational war crimes trials that inspired Judgment at Nuremberg, celluloid trials have provided a compelling source of entertainment. 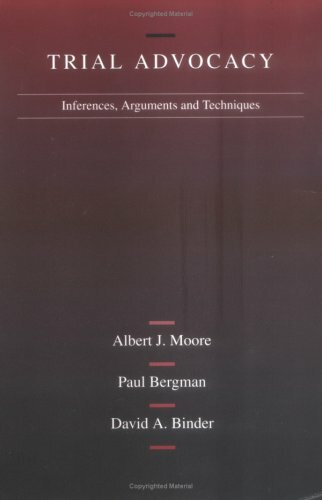 9780820559957 | 2 edition (Matthew Bender & Co, March 1, 2004), cover price $76.00 | About this edition: This book breaks with tradition to provide both a theoretical and practical understanding of the Federal Rules of Evidence. 9780820543970 | Matthew Bender & Co, May 1, 2000, cover price $60.00 | About this edition: This book breaks with tradition to provide both a theoretical and practical understanding of the Federal Rules of Evidence. 9780314065308 | West Academic, June 1, 1996, cover price $101.00 | About this edition: Explains how to prepare a case for trial by identifying historical factual propositions that satisfy applicable legal elements; identifying evidence and inferences tending to prove or disprove the crucial factual propositions in a case; organizing evidence into persuasive arguments, whether the evidence is disputed or undisputed or suggests an implausibility in a witness' story; and understanding the influence of "silent arguments" and taking advantage of or countering such arguments. 9780314011435 | West Academic, August 1, 1992, cover price $51.00 | About this edition: Provides a unique, realistic setting for evidentiary analysis; narrows the gap between theory and practice.